Austrian elections were closely watched in the Balkans and not just for the strong showing of the far right FPÖ, but also in regard to the repercussions for the region with a new government in the making. In this context, I gave several interviews for N1, Al Jazeera Balkans, Dnevni Avaz and European Western Balkans. Here are some points I made. While last year the large fear in the presidential victory of the Freedom Party’s candidate Norbert Hofer. Ironically, his near victory (and eventual failure) drew more attention than the success of FPÖ in recent elections. Yes, they were nowhere close to last year’s results, but with the conservative candidate for chancellor Sebastian Kurz winning, who openly supported a coalition with the FPÖ and successfully hijacked the FPÖ agenda, their success is greater now in terms of ideas and access to real power. Beyond the dangers for Austria, there are potential consequences for Southeastern Europe. I discussed the negative repercussions of the party policies on the Balkans in the context of presidential elections last year. Their open support for independence of the Republika Srpska, courting the nationalist, corrupt and autocratic president of the RS Milorad Dodik and their rejection of Kosovos independence puts the party in diametric conflict with European and Austrian policies in the region for the past decades. While Kurz is a too clever politician and having gained his experiences as Foreign Minister, he would not let FPÖ take Austria into open conflict with EU policies. However, his opportunistic support of undemocratic, nationalist and corrupt VMRO-DPMNE under the leadership of Nikola Gruevski in parliamentary elections in December 2016 highlights his willingness to sacrifice support for rule of law and EU integration on the altar of (seeming) national interest and personal advantage. Thus, there is less need to worry about Austrian policy turning 180 degree on the Balkans . However, even the combination of pursuing foreign policy as a product of domestic anti-immigrant campaigning, a more isolation trend, small moves towards a more pro-Russian and “pro-Serb” nationalist line would be destructive for the Balkans who risk loosing or at least seeing a decline in Austria as a key partner. As a recent commentary in “Der Standard” notes ,there is an inherent anti-systemic, German-national core in the FPÖ that is likely to make it an unreliable and dangerous partner in government. Beyond the immediate policy towards the Balkans, it will matter whether Austria will align itself closer with the Visegrad group and emulate some of the more populist policies of the region. Thus, it would also undermine the idea of liberal democratic values in its foreign policies, but in domestic politics and “lead by example.” This will be welcome by Central and Southeast European prime ministers who have openly attacked liberal democratic values, either implicitly or explicitly. On the plus side, the foreign ministry and its diplomats are committed and engaged in the region. They will be able to absorb some of the political changes, similar to the state department after the election of Trump. However, a clear and signal in the government formation and the Austrian EU presidency will be required to dispel doubts about the future government and they will have to extend beyond the declaratory statements of Sebstian Kurz emphasizing the European character of any future government under his leadership. Serbia has held parliamentary elections in 1990, 1992, 1993, 1997, 2000, 2003, 2007, 2008, 2012, 2014 and will hold early elections in 2016. This is not to mention the elections of the parliament of the Federal Republic of Yugoslavia in 1992, 1992/3, 1996 and 2000. A citizen who turned 18 in 1990 thus could vote 15 times for parliament in two and a half decades, not to mention the ten presidential elections since 1990. If the frequency of elections where a standard of the quality of democracy, Serbia would be a great democracy–it is not. Of the 11 Serbian parliamentary elections in the 26 years since the introduction of a multiparty system, 7 were early elections. Some where held because the governing coalition broke apart (i.e. 2008), but most were the result of the ruling party trying to secure an advantage by calling early elections.None of these elections is as gratuitous as the one called just now by Prime Minister Vučić. In the 2014 elections the Serbian Progressive Party secured a majority with 48.35%, greater than any party before it, including the Socialist Party under Milošević at its most successful poll in 1990. It could have ruled alone with a majority of 158 seats of 250, but decided to form a coalition with the Socialists. Its grip on power is strong and there is no conceivable reason why early elections would be necessary (I made a similar argument in 2012, sorry for being repetitive, but it ain’t me calling early elections). Calling early elections is in the toolbox of populist rulers with an authoritarian streak. Tudjman used a similar tactic in 1995 after the military victory over the rebel Serbs and Gruevski has been calling early elections in Macedonia in the past (even the ones in April are forced by him against the oppositions will). But why hold elections when you hold a majority in parliament? Such a step might seem risky for an incumbent. After all, one might loose power (and indeed this was the case for Milošević in 2000 and Tadić in 2012). For Vučić, there are first strategic calculations. Using a high level of popularity and a disunited weak opposition is a good opportunity to put some more year in power “in the bank”–who knows what will be when the next regular elections are due? Furthermore, frequent elections campaigns prevent the opposition from recovering from previous defeats and perpetuates a weak opposition. There are also more systemic reasons for early elections: As a populist incumbent, Vučić can use elections to mobilize voters and rule as a campaigner. A populist in power is always caught between speaking in the name of the people against the elite–whatever it may be–while actually establishing a new elite. This balancing act is facilitated by elections which pit us vs. them and distract from governing. Second, the current government is based on a one-man-show, Vučić. The dominance of one person of the government and country functions in the context of campaigning, but displays its weaknesses in governing, as the cadres of the party are weak and often incompetent and lack the popularity of the party leader. It is an election year in the Balkans, besides Serbia, Montenegro and Macedonia will also go to the polls in the coming months. However, so far these elections promise little progress in terms of democracy or reforms, but threaten to reaffirm semi-authoritarian rule in the region. 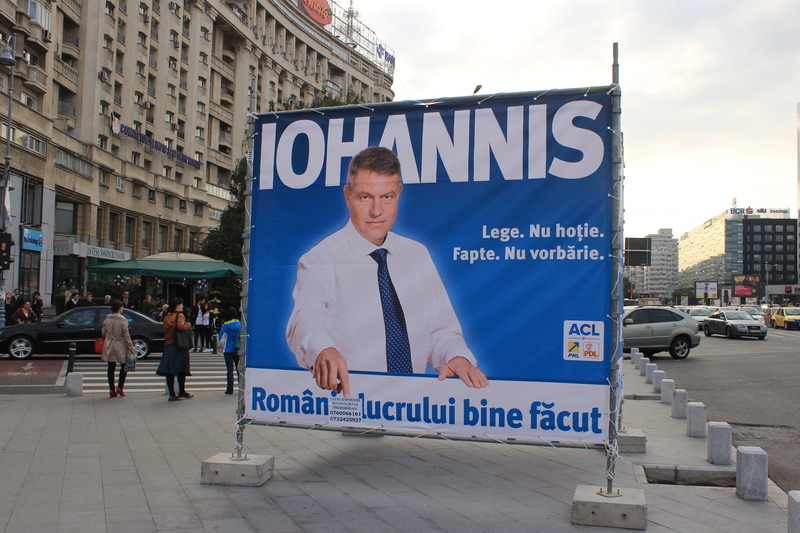 The election of Klaus Iohannis, the mayor of Sibiu as president of Romania has been remarkable for a number of reasons. Not only did he lag behind in the first round of elections by 10 percent (30.37 to 40.44%) to Victor Ponta, the prime minister, but also few of the opinion polls expect his victory that turned out to be fairly decisive (for official results see here) after a close run at first, leading 10 percent over Ponta. However, it is less the election arithmetics that are striking as background of the victorious candidate and the type of politics of his opponent. Klaus Iohannis (or Johannis to use the German spelling of his last name), is a member of the tiny German minority of Romania. He has been mayor of Sibiu for 14 years as a candidate of the German minority organisation, the Democratic Forum of Germans in Romania. The fact that he won the election in 2000 and subsequently with a large majority, desping Germans constituting only a small minority in Sibiu (less than 2%) suggest a broad appeal transcending classic minority politics. His victory at the national level, now as candidate (and president) of the conservative PNL confirms this. The switch from minority to main stream political parties is difficult in most European countries and the election as president as a member of a minority is quiet extrodinary. Several media attacked Iohannis for his minority background and in particular to him not being a member of the Orthodox church and Ponta himself made use of this theme in a convoluted comment“It’s nothing bad about Mr Iohannis being a German ethnic, but no one can accuse me of being a Romanian ethnic. We live in Romania after all and I am proud to be Romanian. The same about religion. It’s nothing bad about Mr Iohannis being a neo-protestant, but no one can reproach me with being an Orthodox”. Considering the close link of religion and national identity makes the victory of Iohannis more important. In a region where minorities have been included in parliaments and in governments, but the distinction between minority and majority has remainded salient, his victory is important. While Macedonia had a Methodist president, Boris Trajkovski, he was still clearly identified with the Macedonian majority and Slovakia had Rudolf Schuster as president (1999-2004), who is of German and Hungarian background, but this was not a feature of his political career and he was not a minority representative, but rather a former Communist who had joined the democratic opposition in 1989. The victory of Iohannis highlights the potention of minority politician become national politicians and that starting a career representing a minority does not preclude a broader appeal, in fact without it, Iohannis would have never been able to represent the German minority effectively. A caveat is in place here, the fact that Iohannis hails from the small German minority, associated with Germany and thus the EU and ‘the West’ makes him more able to transcend the majority-minority divide than if he had been a member of the much large Hungarian minority or a socially stigmatized group, such as the Roma. 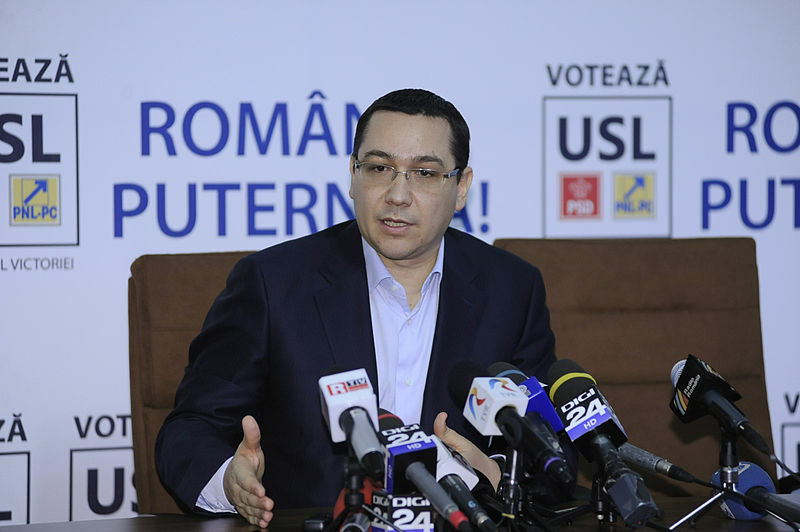 The second level at which the victory of Iohannis is striking is in the defeat of Victor Ponta. In recent years, Ponta has been on the way to emulate the emerging pattern of soft semi-authoritarian rule in Central and Southeastern Europe, as Hungary under Viktor Orban, Macedonia under Nikola Gruevski, Milorad Dodik in the RS in Bosnia, Milo Djukanovic in Montenegro and recently also Aleksandar Vučić in Serbia. A combination of populism and clientalism has been able to combine control using undemocratic practicies with EU membership (or integration). These elections demonstrate that it them that are the archiles heel of these regimes. While they can manipulate and use state resources to their advantage, they still have to win on election day. A strong social media campaign and highly motivated Romanian voters abroad helped to undermine these practices. Of course, Ponta remains in office as Prime Minister, but complete control over politics in Romania remains elusive for him (unlike Orban). After Dodik suffered an important setback in Bosnian elections last months, it shows that these regimes might have been enduring, but also are weak. The victory of Iohannis might thus have a demonstration effect on other countries in the region. While some observers have warned of excessive optimism, in particular in terms of addressing the economic and social ills of society, it does send two clear messages to neighboring countries: First, a member of a minority can become a president and soft semi-authoritarian regimes can be broken, through elections. I am re-blogging my analysis of the Serbian elections written for the new Balkans in Europe Policy Blog. When Aleksandar Vučić gave his victory speech on Sunday, after the resounding victory of his Progressive Party, his seriousness seemed in no proportion to his success. For the first time, since the second multi-party elections in 1992, can a single party govern the country alone. With 48.34% of the vote and 156 (of 250) seats in parliament, the party does not require a coalition partner, unless it wants a majority to the change the constitution. There are dangers in this victory, both for the victor and for the Serbian democracy. First, Vučić and his party might have won a Pyrrhic victory. The elections were triggered by Vučić to diminish the rule of the prime minister Dačić and his socialist party. While he achieved this (although the SPS remains as strong as before in terms of votes), he cannot blame bad decisions on a coalition partner if he is to govern alone. It is thus unsurprising that despite the large majority, SNS seems to want to include some other parties in government. However, even if this were to be the case, the SNS will have a hard time bringing about early elections, as it did this time around. This technique, a favorite among incumbents in the region, (esp. in Macedonia and Montenegro) of getting re-elected when opinion polls are favorable, will not be easily available to the new government. Finally, the weaknesses of the party will become even more apparent. It failed to run a visible candidate for the mayor of Belgrade, as it lacked convincing and popular politicians, besides Vučić. 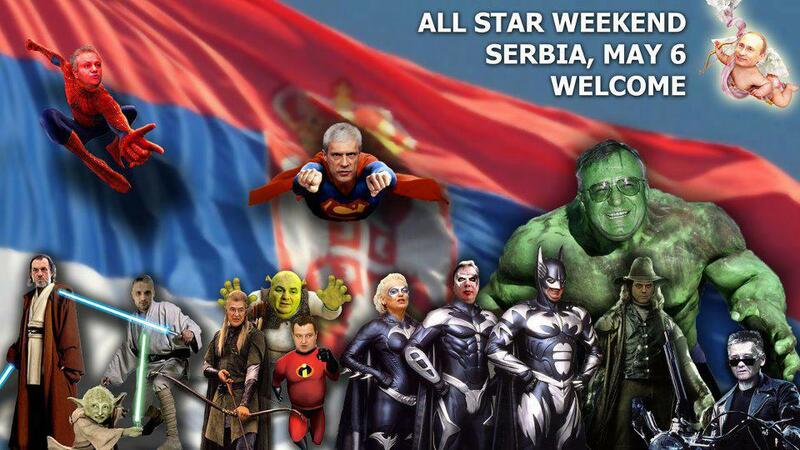 If the party is to govern effectively, it will quickly need to increase its capacity, since cloning Vučić, as some satirical photomontages suggest, is not an option. The risks for the Serbian democracy are equally apparent. A large majority, in a political system that is used to coalitions, bears its risks in the best of circumstances. However, Serbia lacks checks and balances to hold their governments under control. To some degree, coalition governments have been (flawed) alternatives to checks and balances. With few independent institutions, many loyal media outlets and two of the three opposition parties more eager to work with the Progressives than to criticize them, there is a risk that there will be too few critical voices in these institutions. The focus of outsiders on the Serbian government delivering on Kosovo has also muted external scrutiny of un-democratic practices. Not least, the elections themselves are a reflection of a problematic understanding of democratic processes. As a result, the elections do raise serious questions about the future of democracy in Serbia. It seems unlikely that the new government will become authoritarian, or step back into Miloševićs shoes, but Serbia might move away from democratic consolidation and towards a hybrid system that we can observe in other countries of the region. In addition to this development, the elections have also highlighted the decline of the right and a general decrease of ideological differentiation in the party landscape. A key feature is the continued decline of the extreme right and conservative parties in Serbia. For the first time since 2000, Vojislav Koštunica’s Democratic Party of Serbia is no longer represented in parliament. After being mocked as a “kombi party” for its ability to fit all members into a van in the 1990s, it is back at its beginnings. The opposition to EU integration and focus on Kosovo has not paid off. Similarly, other parties, on the nationalist end of the spectrum, fared badly. The Serbian Radical Party continued its decline from 4.62% to 2% and Dveri, a more recent extreme right wing group, dropped from 4.34% to 3.57%. In addition, even smaller right-wing groups split less than one percent. This overall decline of the extreme and conservative right is an important, and easily overlooked, development in Serbian elections. It can be attributed to three factors: First, the populism of the Progressive Party itself, constituted by former radicals, has been able to absorb some of the vote. Second, the fragmentation of these parties—various talks of pre-election coalitions among Radicals, DSS, and Dveri failed—discouraged voters to choose any of them. Thirdly, the trend is part of a regional development. In Croatia, but also in Romania, the extreme right has declined in the context of EU accession. As the EU effectively rejects such parties, they become less attractive as most citizens are (skeptic) supporters of EU accession. Kosovo, and other national issues, also no longer figure into the agenda that voters care about. The elections were fought among parties that all formally share the same goals and have no discernable ideological differences. All parliamentary parties want to join the EU, talk of “reforms” and oppose corruption. As a consequence, there is no reason that the incumbent would not win, when there is no alternative that is different. Besides the ideological similarities, most parties also demonstrated a willingness to form pre-election coalitions with parties whom they have few commonalities, and display, even for Serbian standards, a surprising lack of respect for democratic principles. When Boris Tadić made his comeback, after breaking with Djilas and the Democratic Party, he did not form his own party, but the Greens of Serbia were taken over by him (or offered). They changed their name to add «New Democratic Party» and voila, a green party became the election vehicle for Tadić. The Liberal-democrats of Čedomir Jovanović used to offer a more radical reform program than the Democratic Party. However, its unprincipled coalition with a conservative Bosniak party, close to the mufti of Sandžak Zukorlić, and its continuous flirting with the Progressives discredited this claim. In effect, the only two programmatically consistent electoral lists where those of the Democratic Party of Serbia, which failed to enter parliament ,and the list of the former Minister of the Economy, Saša Radulović, „Dosta je bilo“ (Enough of this), which radically criticised the influence of political parties and the economic policies of Serbian governments in the past decade. While the consistency of the DSS is likely to lead them further into political oblivion, the list of Radulović might become more significant in Serbia. Having led a shoe-string campaign, barely managing the register of the list two weeks before the elections and facing strong attacks in the media, the 2.08 % the list achieved is no small feat. Another way of rejecting the ideological and ethical homogenisation of Serbian party politics was a repeat of the „invalid vote“ campaign of 2012. Several activists called on citizens to go and vote, and then to reject any candidate by invalidating the ballot (see here from some examples). Altogether, some 3.17% of citizens did exactly that. While not all may have invalidated their ballot for the same reason, the high number suggests that most, probably, deliberately invalidated their ballot in protest. These numbers are lower than in 2012, when they were 4.39%, but remain remarkable. Finally, the easiest and most common manner of rejecting the current political offerings has been to simply not vote. Turnout was only 53.12%, or four percent less than 2 years ago, and the lowest for Serbian elections since the introduction of the multiparty system in 1990. Thus, the Progressives have been able to capture the largest share of the electorate of any party since 1992, but their success is not built on energizing the electorate or changing the perception of politics, but rather as a result of citizens either resigning to the inevitable, or the irrelevant. The broader dissatisfaction with party politics will not be remedied by SNS, and thus some broader opposition, reflected in social movements or new parties, remains a distinct possibility, even as the pluralist political space might be decreasing. The upcoming early Serbian parliamentary elections are going to be contested by at least 10 parties and coalitions and likely a few more and the differences have rarely been so hard to detect. The last elections in 2012 where the first elections in which the largest parties did not differ fundamentally about the direction of the country. The consensus on EU integration and a pragmatic approach on Kosovo made the victory of the progressive party possible and removed the main cleavage of politics in Serbia during the 1990s and 2000s (Vreme offers a good timeline of all previous elections with slogans and results). As lines of division became blurred, the political scene in Serbia lacks clear defining markers and only few parties, such as Koštunica’s Democratic Party of Serbia (DSS) do not share this overall consensus. If there are increasingly fewer distinguishing characteristics between parties in Serbia, strange bedfellows emerge. When Liberal Democrats (LDP) formed a pre-election coalition with the Bosniak Democratic Community of Sandžak (BDZS), it raised some eyebrows. The BDZS is the outfit of the ambitious Mufi of Sandzak, Muamer ef. Zukorlić (Not to be confused with the BDZ, another wing of the same original party that plans to run jointly with other minority parties). Besides his apparent preference for white BMWs with personalized license plates (‘Mufty‘) he has been a polarizing figure in Sandžak, defending a conservative agenda and being hostile to liberal NGOs, hardly compatible with the platform of the LDP. 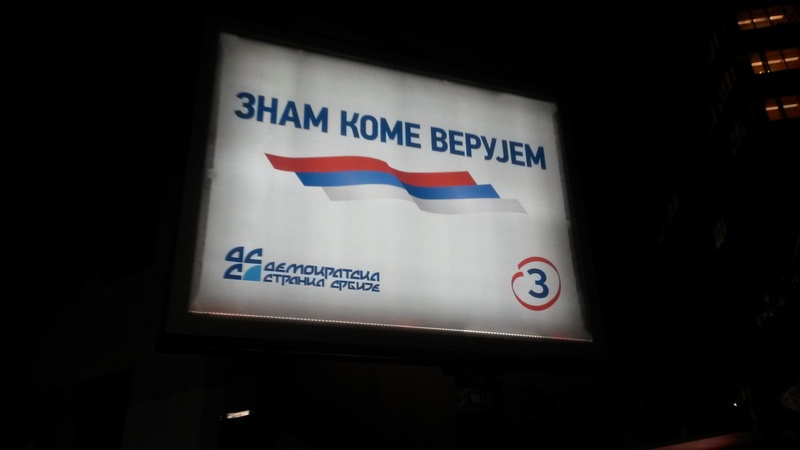 In addition, nearly every coalition in the elections has a party claiming to be social democratic or socialist on its list (the fitting slogan of the SPS in 1993: ‘Kad bolje razmislimo, svi smo mi pomalo socijalisti’–we think about it, we are all a bit socialist): LDP included the small Socialdemocatic Union (SDU), the Progressive Party, itself ostensibly a centre-right group, included the Socialdemocratic Party of Rasim Ljajić–the ultimate survivor of Serbian politics and in government uninterrupted since 2000–and the Socialist Movement, a one man show of Aleksandar Vulin, who was an activist in Mira Markovićs JUL and now combines defending Kosovo with Che Guevara. Then there is the Socialist Party of Serbia, and the New Democratic Party of Boris Tadić, running with the League of Socialdemocrats of Vojvodina (LSV). Finally, the Democratic Party (DS) is a member of the Socialist International. A final way of looking at the jungle of parties running for elections is Democratic Party itself. Since its founding in 1990, it has never been able to change leadership without a split: as a result, four parties running stem from the original DS, including Koštunica’s Democratic Party of Serbia (DSS) that split in 1992, the LDP founded in 2005 and the New Democratic Party that former president Tadić established just a few weeks ago (technically it is not a new party, Tadić took over the small green party to avoid the time consuming and costly process of registering a new party). The New Party (NS) lead by former PM and DS official Zoran Živković ended up in a pre-election coalition with DS rather than taking the risk of running independently. Another survivor is Vuk Drašković who began his political career with Vojislav Šešelj and later the Serbian Renewal Movement that was a leading opposition group in the 1990s. He managed to hang on through pre-election coalitions with New Serbia in 2003, with the DS in 2008, with the LDP in 2012 and today with the Progressive Party. ‘I know whom to trust’ Apparently the answer is DSS. The fragmentation (luckily) also extended to the right of the party spectrum. Despite efforts to form a pre-election coalition between the DSS, the Radical Party and Dveri a more recent extreme right wing outfit, the talks failed and they all run separately, as does another right-wing group called the Third Serbia (TS) and also the movement 1389 announced it would independently. As a result in opinion polls, only DSS is likely to enter parliament among these groupings. The confusing party landscape is largely facilitated by the election law. With a five percent threshold and no higher threshold for coalitions, larger parties see an interest in linking up with smaller groupings to increase their vote and small parties can enter parliament although their support would certainly be well under five percent. As voters cannot select candidates and the entire country is one electoral unit, there is also a strong bias towards candidates from Belgrade with the rest of the country underrepresented. Furthermore, it leads to oddities, such as Boris Tadić being the main visible poster boy of the New Democratic Party, but not being on the list of candidates. Amidst all this confusion, there is likely to be one clear winner, the Progressive Party of Aleksandar Vučić. While opinion polls are often biased, several polls (see here, here and here) suggest that the party and its partners will gain around 45 percent of the vote. The fragmentation of the Democratic Party between the current party led by Dragan Djilas and the New Democratic Party of Tadić help contribute to the strength of the party, but in essence the elections were triggered by the SNS to translate its popularity into seats and to marginalise PM Dačić, who has become a prime target in the pre-election campaign. At this point, it is not yet clear whether SNS will be able to govern on their own (if they would this would be a first in recent Serbian politics). If opinion polls are correct, Vučić’s party will only need a few more votes to form a government and it currently has a number of options with whom to form a government. Unlike in 2012 when it relied on the socialists, it will be able to choose among multiple partners and thus drive the price down these can extract. Currently, the Liberaldemocrats of Ćeda Jovanović seem like the most attractive partner. The party, if it enters parliament, will be fairly small to extract much influence and help the SNS with a reformist image. It is thus no surprise that candidates from the SNS have been careful not to critizise Jovanović although he used to be the main target of criticism on the right. The other wild card is Boris Tadić. His return to active politics after his electoral defeat in 2012 and losing power in the DS afterwards has polarized. Either way, the elections will seal the dominance of SNS and leave behind a fragmented and weak opposition that is currently shaped by infighting. It thus seems that the SNS will a number of years ahead in which it can govern with a safe majority. The main weakness of the party will come from within, as it continues to lack qualified people to meet Serbia’s challenges. Late in 2013 three singers calling themselves the “three piggies and the bad wolf zahar” performed the song “the first vice prime minister” for the ever popular/awful entertainment show grand parada, the Serbian version of the Musikantenstadl. What might sound cryptic to an outsider is clear to anybody following Serbian politics: the Prvi Potpredsednik (or short just PPV, V stands for Vlada , government) is a title that formally does not exist, but the job Aleksandar Vučić currently holds. The composer Milutin Popović Zahar claims it to be a humorous tribute to Vučić and judging by his previous ‘tributes’, he is talented in telling from where the wind blows. Among the 2,500 compositions, there is Živela Jugoslavija (Live Yugoslavia!) from the 1980s and more recently Vidovdan. The musical tribute is just one of the sillier aspects of the growing personality cult surrounding Vučić, who after a year or so of discussions whether early elections should be held, finally announced parliamentary elections for 16th March (officially called by President Nikolić). Just a few days later, as a snow storm blocked the highway Belgrade-Subotica, the new super hero jumped into action. Together with the other Serbian ‘saint’, tenis player Novak Djoković, he himself went to the blocked highway to savee passengers stuck in the snow. This PR stunt in best Putinesque style, unleashed a flurry of mockery on-line, including the above-pictured photos and a number of videos. However, the message in Serbian tabloids was clear. Vučić and Djoković are heroes, while Tadić and Daćić are secretly meeting in Munich (also signaling that the current PM is fair game). For good measure, Kurir also listed what ten public personalities did instead of saving children (such as drinking, watching TV, featuring Čedomir Jovanović, Saša Radulović who recently resigned as minister for the economy and has since been viciously attacked by the media loyal to the governing SNS and, for good measure, Roger Federer). This is just the beginning of the election campaign for these superfluous parliamentary elections. Serbia has had more than its fair share of elections over the past 24 years. In addition to three Yugoslav parliamentary elections (1992, 1996, 2000), 10 Serbian presidential elections (1990, 1992, 4 rounds in 1997, 3 failed rounds in 2002, 1 failed round in 2003, 2004, 2008, 2012), Serbia held nine parliamentary elections. Thus, excluding local elections, Serb citizens had the ‘opportunity’ to vote in 22 elections in 24 years. In fact, of all the parliamentary elections since the first ones in 1990 (1990, 1992, 1993, 1997, 2000, 2003, 2007, 2008, 2011) only three were regular elections (1997 and 2007, 2012). The others were called early because governing coalitions broke down (2003, 2008), or because the ruling party hoped to improve its chances (as in 1992 and 1993), as is the case today.As some earlier parliamentary elections, the forthcoming elections serve no obvious purpose besides consolidating the SNS political dominance. The current governing coalition is not in crisis and the despite the continuous talk of early elections, this had little to do with bad relations between parties in the coalition or some political difference in terms of substance or style. It is only clear that the junior partner, the Socialist Party (SPS) is likely to be pushed aside after new elections. Being the only party able to form a coalition with both large parties (DS and SNS) last time around, Dačić was able to negotiate a disproportionally large share of political power and this is coming to haunt him now, as Vučić apparently no longer wants to be just PPV, but take over the primeministership. Even though it seems unlikely that his Progressive Party will be able to governing without partners, there is no shortage of potential coalition partners. In fact, candidates are lining up. Thus, last time around the SNS had very few potential coalition partners that could drive up the price for forming a coalition, now SNS will be able to drive down the price and bargain hard. 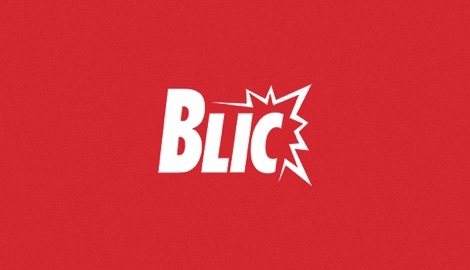 In addition to allies such as Rasim Ljajić’s Socialdemocrats, the Liberal-Democrats have signaled their willingness to join a coalition, as have some minority parties in addition to the Socialists and their partners. To some degree, it seems merely logical that the most popular party should govern and also lead the government. The construction of the current government has been awkward and meant that for crucial decisions, such as negotiations with Kosovo, not only the prime minister, but also the PPV had to be fully included. The popularity of the SNS is compounded by the weakness of the opposition and thus, a resounding victory seems appropriate. However, the attacks by media close to the SNS on the opposition, the populist reflexes of Vučić and calling for elections when there is no other justification than maximizing power, the risk of Serbia moving towards a populist “demokratura” is real. Already in Macedonia and Republika Srpska, the combination of constant campaigning, the instrumental use of early elections (in Macedonia), reducing space for critical media and the social and nationalist populism of the government has seriously eroded the democratic system and its institutions. If Serbia moves this way, it is important for outsider to look more carefully. So far the temptation for the EU and other outsiders has been to ignore such trends over the government’s willingness to compromise over Kosovo. The victory of Tomislav Nikolić in the second round of Serbia’s presidential elections last Sunday surprised most observers, including myself, and demonstrated once more how unreliable most opinion polls in Serbia are. Already in March (in fact in January he first wrote it), Dušan Pavlović, a good friend and a level-headed observer of politics, made a key observation: Tadić scheduled presidential and parliamentary elections to take place at the same time to have his popularity “rub off” on the Democratic Party which has been considerably less popular then him personally. The idea was that by combining the two elections, DS would be more likely to win a new majority in parliament. 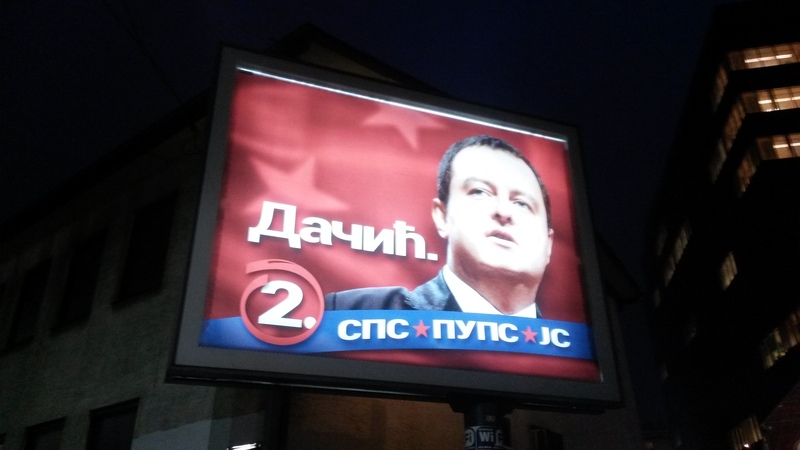 But Dušan Pavlović wondered, rightly as it turns out, whether the dynamic could not also work the other way around: What is the unpopular party tainted Tadić as candidate? The worst happened, at least for Tadić. The quick deal with SPS after the first round of elections sent the wrong signal, there will not be change: Before Sunday night, it looked like the government will be very much the same, as will be the president. This was clearly too much of the same for too many voters. What tainted Tadić in the eyes of many liberals has been his dominance of the government and holding onto the presidency of the party while being president, controlling the PM and giving too much space to Ivica Dačić and SPS–a coalition that seemed to have developed into a relationship. It is thus that not only Vesna Pešić, but also others who belong to the liberal end of Serbian politics decided to vote for Nikolić (or at least threaten they would). For many ordinary citizens, DS and Tadić were also no longer the clear “European” option, as Eric Gordy notes: ” All the harm people had been warned to expect from Tomislav Nikolić had already been inflicted by Boris Tadić.” In addition, the difficult economic situation does not help any incumbent. 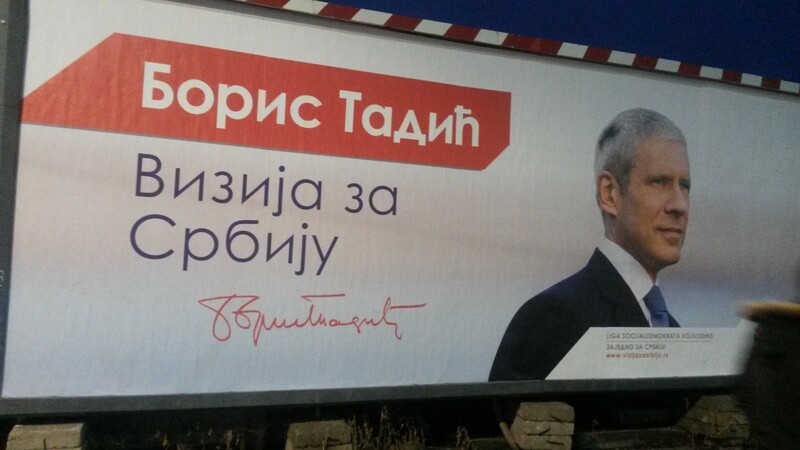 Finally, the DS committed a strategic mistake in its electoral campaign: The campaign was largely negative, warning of the dangers a victory of Nikolić and SNS. Once more to quote a cartoon by Marko Somborac, where he depicts a DS election poster stating “We know, unemployment, corruption, bad living standards, but ‘buh! Toma!”. A campaign based on fear of a Nikolić victory was credible in 2004 and 2008 when he stood for the SRS, but todays SNS is hard to distinguish from the Democratic Party, especially when it comes to the two big themes EU and Kosovo. Thus, the transformation of the political system since the break up of the Radicals has been ignored by Tadić’s campaign, while citizens did note that there has been this important shift. Thus, observers like Andreas Ernst of the NZZ are right that the outcome is more a punishment of Tadić than a victory for Nikolić (who did not seem to expect to win), yet without Nikolić’s transformation, this outcome would not have been possible. In short, many who either did not vote at all or voted for Nikolić last Sunday are not only punishing Tadić because of Tadić’s policies, but also because it became possible to punish him by voting for Nikolić. So what does this mean? A long, excellent, interview Michael Martens from the FAZ conducted with Nikolić shortly before the elections demonstrates why there is good reason for any Serbian citizen to be embarrassed that this man became Serbia’s president. Not the fact that his academic credentials are dubious, but the fact that is unwilling to own up to his past and his cynical and hateful statements until a few years ago. It seems clear that he has made a political turn-around after 2008 and all the first signals after his election victory suggest that he will continue along these lines, but his often twisted and confused responses about past statements suggest that the break was pragmatic, not substantial. It is easy to be a good European in opposition when the price is low–but whether he is able and willing to make difficult compromises is far from obvious. He thus runs the risk of becoming another fair-weather European politician in the region, who likes the EU because voters do, but not when it comes to giving some pet issues. Of course, he might also be able to turn out to deliver on key issues, such as Kosovo, as he does not need to worry about a strong contender to his right calling him a traitor. Whether he will be come part-time pro-European politician or will be willing to make painful compromises remains far from obvious. Finally, if he is unable to forge a SNS led coalition, he might remain a lame duck president, reduced to the constitutional powers of the president. That in its own right might not be such a bad thing for Serbia’s democracy. For once, elections in Serbia will not be a historical crossroads during next Sundays elections. News reports over the past decade have termed all parliamentary and presidential elections as historical: they were in 2003 over the success of DOS in the aftermath of the overthrow of Milosevic, in 2007 and 2008 the Kosovo issue raised the spectre of a take-over by the radicals. The elections this year are historical for Serbia only for not being historical. For the first time since the introduction of multiparty elections in 1990, it will matter not that much which of the two largest parties wins the elections. There is no doubt that Tomislav Nikolic and many from the “Progressive” Party (SNS) have an unsavory past with the Radicals and their statements and policies during their previous life are hard to accept, but they stated goals differs only marginally from the Democratic Party. Of course, one can doubt their committment the EU integration and liberal policies or, more importantly, their competence, but there is little doubt that the battleground in Serbia has shifted towards the centre. Already in 2003 and 2007 the Radicals became the largest party less for their extreme nationalist positions, but rather for their social populism.Today, the is little appeite among either the electorate or the SNS to challenge the consensus that has emerged in Serbian politics over EU integration, reform and a rhetorical committment to Kosovo. Latest opinion polls seem to suggest that the SNS might be narrowly defeated by the Democrats. Even if this is not the case, they will have a hard time to form a government, having a much more limited choice of potential coalition partners: both the Radicals and Kostunica would take the SNS away from its desired international rehabilitation and make any progress in terms of EU integration impossible, leaving the SNS only the coalition around the Socialist Party of Ivica Dacic as a significant partner. 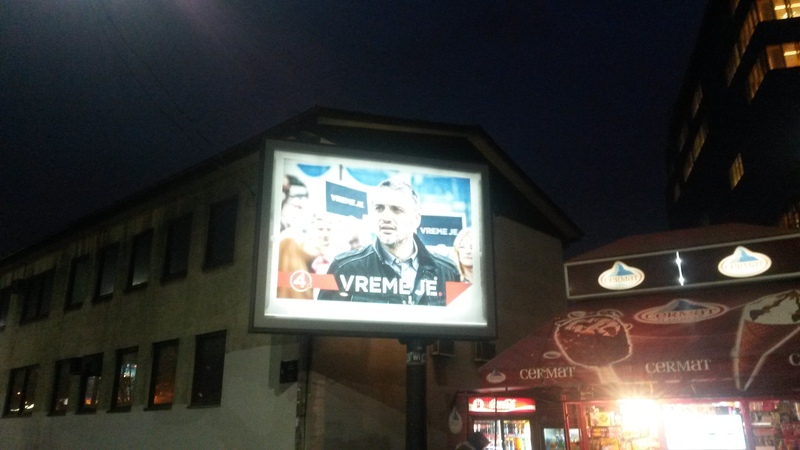 The DS can count on the popularity of Boris Tadic and three partners tipped to enter parliament, the liberal reformist LDP, the eternal governing party (since 2000) G17 now called United Regions of Serbia (in cooperation with some local strongmen) and the Socialist Party. Thus, the elections seem to point towards a continuation of the current government with some reconfiguration among the coalition partners–and even if this were not the case, Serbia has moved towards a political system that is far from perfect, but fear that every election is a juncture between EU and abyss is no longer justified.